VETERANS AFFAIRS CHAIRMAN: Section 22. Shall: Serve to provide information and advice for members of the Order who currently serve, or who have served, in the United States military. The chairman shall focus primarily in areas pertaining to Veteran’s benefits, advocacy, and the development and maintenance of a historical record of Hibernians that have served. The individual appointed to this position shall be an honorably discharged veteran of the United States Armed Forces or an active duty member of the United States Armed Forces. Veteran brothers – WELCOME to the Veterans Affairs homepage. YOUR homepage! I am proud and privileged to serve you the best way that I know how – with good, effective communication. I apologize that this site hasn’t been updated since my term began, but I hope – with your help – to rectify that asap. My intention is to work with you, and selected volunteers that will make up an “Advisory Team” to help bring you the best information there is on Veterans benefits, services, and entitlements. If you’ve been following my articles in the Hibernian Digest, you’re already aware of some of things that we’ve published – some website links and resource tips, as well as the creation of the Hibernian Veteran lapel pin. More on those subjects below. My hope and goal is to be able to provide a greater amount of information via this website than there is space for in the Digest. I have been receiving reports from local Veterans Affairs chairmen around the country since I was first appointed. I hope that now, with this website, to be able to share a lot of that information with all of you. I thank all of the Veterans Chairmen for providing me with that valuable input and information! Brother Danny Eakins of Ohio, who serves the State of Ohio professionally as the State Administrator for Veterans Affairs, has provided me with valuable guidance and information found below. I first met Danny through our National Vice President, Danny O’Connell, also of Ohio. Danny E’s AOH Division was the one that promoted the great idea of a Veterans pin to me, so we worked together with a team from the National Board to develop it. Our National Historian, Mike McCormack, proposed the design that was decided on, and we were then led to brother Ed Johnson, who’s company – Universal Plating – produced the pin for us. Since the pin was created, many Divisions have presented the pin to Hibernian Veterans on special occasions such as Communion Breakfasts, Conventions, etc, and on just normal occasions such as Division meetings. I have even placed a pin on a deceased brother’s lapel during a Hibernian Prayer Service as he was being laid to rest. The point is that any occasion is the right occasion to present a veteran this pin. I guarantee you that he, and they, and their families will appreciate it very much. Below is a photo of the pin presentation ceremony at AOH Division 32’s Communion Breakfast in Allegheny County, PA. I am hopeful that you will provide me with photos, stories, and information about your own Hibernian Veteran activities so that they might inspire other veterans and/or Divisions to engage in similar work. Please share things like pin presentations, wreath laying projects, food distributions, homelessness, and the many other veterans projects that I hear about via email from you all the time. There are so many Divisions and individual Hibernians doing such great things for our veterans, it is extremely impressive and worth sharing with all of you. 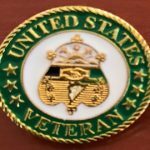 I hope that this website will facilitate the sharing of those photos and stories to give us all ideas on what we can do to help our deserving veterans and ourselves. I’ve also been given the capability of sending group emails to all of you. So, in the event that there is an important event or information that I think you need to be aware of right away, I will compose an email blast and send it to you. Brother Danny Eakins has provided a list of links that should be of interest and service to you, and I am attaching the list to this web page below. Thank you again, brother Danny! As information continues to come in from you, I will selectively post those stories, etc, on this page with the help of our National Webmaster, Jeff Nisler. I wish all of you and your families a blessed and happy Christmas, and a prosperous and healthy New Year! I will update this site periodically going forward as information becomes available to share with you. If you have stories, photos, information, resources, links, etc that you’d like to share with all Hibernian Veterans, please contact me and/or forward them to me at my email address above. Thank you for all you do for the Order and our veterans.